If you've been paying attention to any of the SCOM sessions that were delivered at the recent Microsoft Ignite conference, you'll notice a number of new features that are due for release either in the next Update Rollup or in System Center 2016 - (scheduled maintenance mode and MySQL monitoring for example). These new features have been added as a result of feedback that Microsoft has taken on-board from the general SCOM community and customers that are using the product. 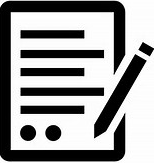 Today, Microsoft have released a new call for customer feedback in the form of an online survey and if you have anything that you want to add to a wish-list for SCOM 2016 or have any complaints about the existing version, then here's your chance to be heard! Have a quick read of the original post from the System Center team and click on the survey link to get started. It shouldn't take you longer than 5 minutes and I can guarantee you that your feedback will be heard. Last week, I was one of the 23,500 attendees that visited the Windy City of Chicago to geek out at the inaugural Microsoft Ignite conference. As the desynchronosis finally subsides this week, I wanted to take a look back through all of the announcements and experiences that were relevant to me and share them on this blog. So what's all the fuss about Microsoft Ignite? 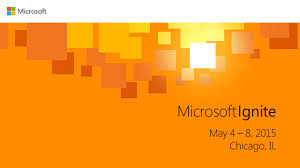 Well, it's Microsoft's first attempt at creating a mega supernova-type conference - bringing together their previous biggest TechEd conference along with also amalgamating smaller events such as Microsoft Management Summit (MMS), SharePoint Conference and the Microsoft Exchange Conference (MEC) to name a few. 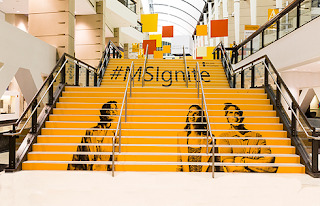 With a combined total of around 23,500 attendees and as an alumni from multiple tours of duty of MMS and TechEd, Ignite definitely felt like the largest conference I've attended so far. 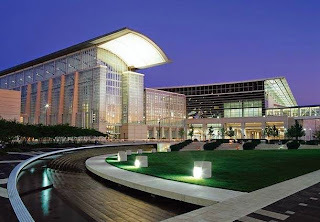 I didn't think that a conference center could be much larger than Houston's George R. Brown Convention Center (where last years TechEd was hosted), but Chicago's McCormick Place must have been at least twice the size to host Microsoft Ignite. It was fair to say that Microsoft took over the whole of this massive venue for the best part of a week and everywhere we went looked the part. The conference kicked off for us on Monday morning with a 30 minute coach journey navigating from the hotel to the conference center through the traffic bedlam that seems to be the norm for Chicago (more on this later). When we got to McCormick Place, we were shepherded down to the main hall for the Keynote. I'm just glad we got there early to get a seat and avoid the overflow rooms. Microsoft's Joey Snow warmed up the massive crowd before the keynote began with some lively dance tunes and you could feel the buzz of anticipation around the room. Satya Nadella came onstage around 9am and immediately set the tone for the week when he talked about delivering hybrid solutions and empowering IT pro's. The announcements came quick and fast as the keynote speakers interchanged for a marathon 3 hours! Although most people were happy with all the new stuff being announced and demonstrated, the general feeling was that the keynote was at least an hour too long. Huge numbers had decided enough-was-enough well before the keynote speakers were finished and there were queues to leave the hall with still more than 30 minutes to go. For me though, I was really impressed with the whole production, professionalism and use of new technology throughout the keynote show and it was certainly a step up from previous keynotes that I've attended. 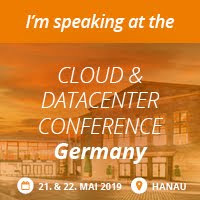 A plethora of new announcements were made during the keynote and as a Cloud OS consultant, the upcoming releases of Windows Server 2016 and System Center 2016 along with the new Microsoft Operations Management Suite were my highlights for sure. A new on-premise offering of Microsoft Azure called 'Azure Stack' was also announced. This will include a new version of Windows Azure Pack but will come with a lot more capabilities to bring it inline with what customers have in the public cloud. Office 2016, SQL 2016 and Skype for Business all got a shout-out along with a new Microsoft Advanced Threat Analytics offering which is available as a public preview release. Also, the new 'buzz' phrase on every server administrators mind for the week was 'Nano Server'. This is a version of Windows Server that has a footprint 20 times smaller than the current Server Core edition! The sheer size of this conference meant that to navigate the Expo Hall (where third-party vendors show off their wares) you'd have been well advised to use a sat-nav! To be fair though, I thought this was a good expo with tons of vendors and product group teams available to answer questions and show you demo's of their products. The free swag was pretty good too and I had to get hold of an additional carry bag by the end of day one to carry it all around with me! For me, these conference events are all about the person-to-person networking and Microsoft Ignite had that in abundance. 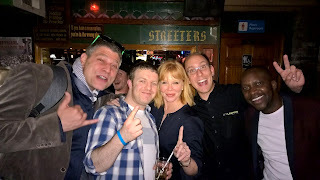 I got to meet up with a good few of my MVP friends along with product group members and some other Irish attendees. With a population of nearly 3 million residents living within the city of Chicago alone (the overall metropolitan area of Chicago has nearly 9.5 million residents), in hindsight, it shouldn't have been surprising to us that the traffic in this city was some of the worst we've ever experienced. From 6am onwards, the roads leading in and out of the city were jammed. 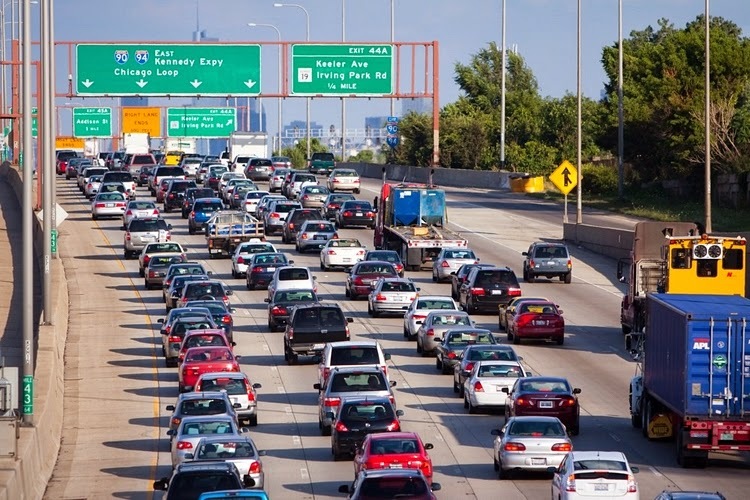 Thankfully, getting a coach to the event in the morning was no problem and there was a dedicated network of underground roads for coaches that led directly to McCormick Place. The overall journey from our hotel took approx. 25 minutes on a good day. The way home however, was a different story. For some reason, Microsoft decided that the coaches would only run between the conference center and the hotels until 10am and they didn't start back up again until 6pm! This meant that 20,000 plus attendees were all scrumming to get a lift back home at the same time each day and with waits of anywhere between 45 minutes to 1.5 hours, this was a right pain. Attempting to grab a taxi instead wasn't much better as there was a similar wait and queue at all taxi ranks! When a taxi did pull up eventually, you had to be on your guard to ensure you weren't being ripped off by some unscrupulous drivers - some where looking to charge $35 for a journey that typically cost no more than $15! Hopefully next year the coach time restrictions will be lifted and the taxi companies will be made aware that they need more cabs down at McCormick Place when there's a conference going on. 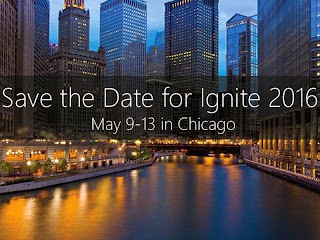 Rick Claus and Joey Snow mentioned in one of their excellent Microsoft Ignite Countdown shows that you should break in your walking shoes/trainers before coming to Chicago. I can certainly vouch for that tip and I haven't walked so much in a single week in a long time! This is a good thing though as Chicago is a really cool city to visit and there's loads to see and do. There's so much we didn't get a chance to do and things like the architecture boat tour, Navy Pier and Millennium Park were highly recommended by other attendees for a future visit to the city. Now to the food. There were some good and some bad experiences with food during our week in Chicago. For a start, the lunches that were served down at the conference were terrible. By the Wednesday, we'd given up hope of getting something half decent to eat and ended up in McDonald's or one of the cafe's for our lunch. The breakfasts and mid-session snacks weren't too bad though and a similar standard to previous conferences I've attended. 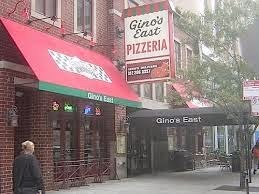 Out and about in Chicago at night-time, we really had the opportunity to sample the various dishes that were on offer and I made sure to eat my fill of Chicago-style Pizza and HotDogs while in town! There was plenty of fun to be had during the week with Monday and Tuesday in particular being the busiest nights for vendor-sponsored parties. With loads of free food and beer on offer, I think everyone had a good time after-hours. For me, I took it relatively easy though as we had an early start each day to kick-off the first presentations. The 'Friends of Service Manager' meetup party in Streeters Bar was a great opportunity to catch up with all my SCSM Lync-up pals too. 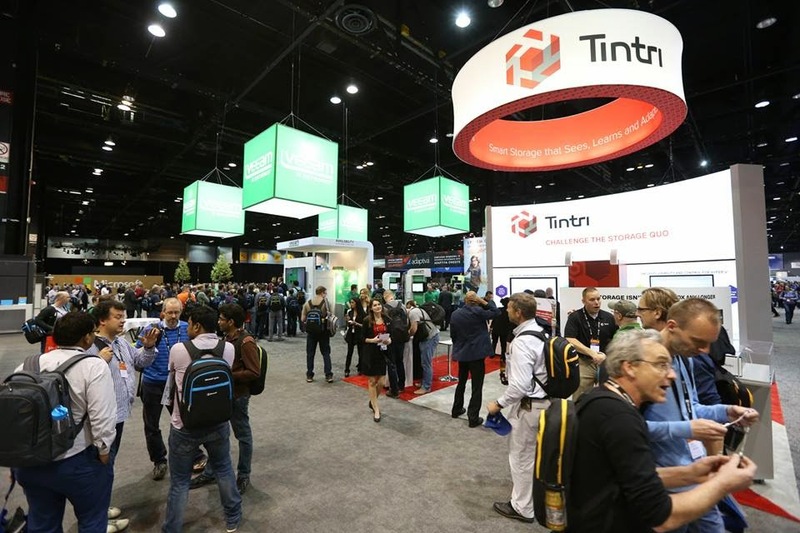 I really enjoyed the attendee party this year which was held in McCormick Place on the Thursday night. It was a massive venue that easily catered for the 23,500 attendees and with food and beer in abundance, the various live acts on show made the night very enjoyable. 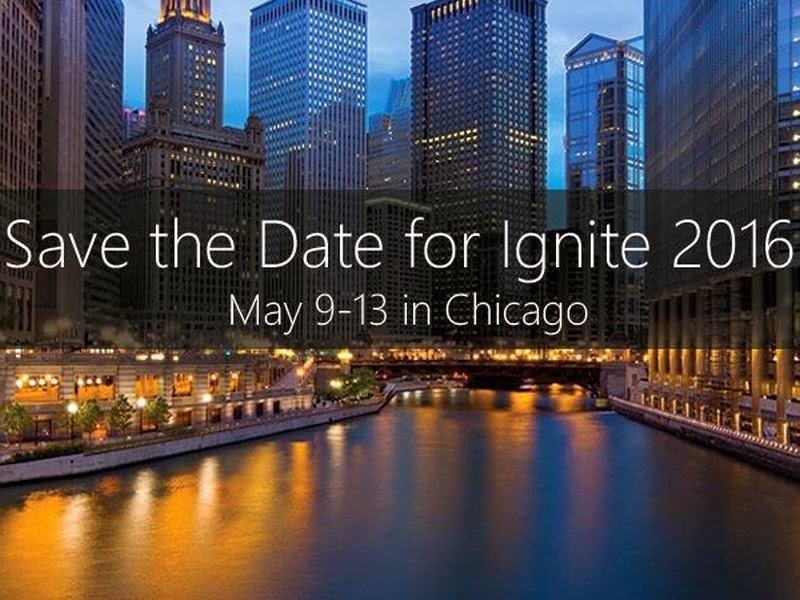 During the week it was announced that Ignite 2016 would be hosted again in Chicago so, taking everything into account, would I want attend next years event?